Firefox version 4 RC 1 was released on March 9, 2011. You may have noticed I am reviewing version 4 which has not been released, however it is due for release soon and being in RC status is quite stable for normal use, it is an accurate representation of Mozilla’s current best browser. I decided against using the latest stable version of Firefox (3.6) due to the slow nature of updates to the browser, this would not be a fair comparison to the other, more up-to-date browsers. Their slow release cycle is a negative for such a community orientated project. Installing Firefox 4 is the same as the previous versions, you get the traditional choices such as install directory and to install start menu/desktop icons, installation is fast and smooth, taking no more than a minute. The Firefox 4 UI makes a dramatic change in version 4, aside from a few small differences the main window is almost exactly the same as Opera, there haven’t been much changes to other parts of the UI, aside from the addon and plugin pages changes I will mention shortly. The change is mostly positive and addon extensions that add extra toolbars don’t make it look as bad as I was expecting, it still creates quite a bland blue/grey space in Windows 7 though. Firefox 4 is much faster even with multiple extensions than it has been in the past, they have really focused on speeding up the startup/shutdown times and it shows, it’s still the slowest browser to start up on my PC but it’s now at a level where it doesn’t matter. This is mainly due to the extensions I have installed, however other browsers with a similar amount of equivalent extensions still don’t take that long. Page load times are very fast and I really don’t notice much of a difference comparing it with other browsers. Firefox 4 really is a big change and there’s much more than I can mention here, but a few of note are: GPU acceleration, multiple changes to the way extensions are handled, Firefox Sync, crash protection for plugins, WebM video support, and a new HTML5 Parser. Firefox Sync works well but the first few times syncing would fail with cryptic messages, this appears to have sorted itself out. GPU acceleration has been added and turned on by default on Windows Vista and 7, this is in keeping up with other browsers but unfortunately it makes the text look weak and blurry, one of the biggest complaints about Firefox 4, it can be turned off but then you lose GPU acceleration. It seems the only response from Mozilla is either that there is no difference, it looks better or you just have to get used to it, even though no other browser does this. I’ve since gotten used to it, but it’s not ideal. Firefox is still the king of extensions and most of my favourites have been updated to work with Firefox 4 or work anyway, the new UI is great and although the listing seems less easy on the eyes, it certainly makes up for it in features. The ability for certain extensions to not need a restart to work is a nice addition and brings it closer to other browsers’ abilities. Firefox is incredibly customisable, if it’s not in the base browser, there’s an extension for it and this is where Firefox is in a level of it’s own, it is the perfect developer’s browser, I need it to be installed on every computer for this very reason, IE9 and Chrome’s developer tools have nothing on Firefox+Firebug+Web Developer+HTML Validator. Overall Firefox is great to use for developing or anything that requires specific extensions and tools but other browsers are now stepping up and for every day browsing it is no longer considered to be the only choice. In addition to this it’s starting to seem like Mozilla believe their way is the only way and Firefox will be on top no matter what they do. The latest version of Google Chrome version 10 was released on March 11, 2011. Google Chrome has a fast version release cycle, though the actual features it gets each version is not very high, however it has been stated by Google that the Chrome versions are different to traditional software versions. 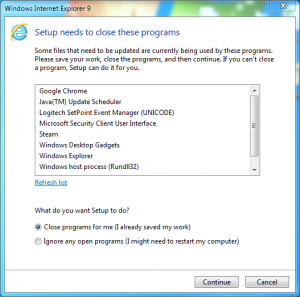 Installation of Google Chrome is fast and simple, similar to other Google applications. Google Chrome’s UI hasn’t changed much since the first version, it’s very simple, combining the traditional address bar and search bar to save space, extensions are kept mostly hidden except for a small icon in the top right, the bookmarks bar has been disabled by default in recent versions but is easily returned, it is the only browser without a title bar and also the only browser that still keeps it’s general clean look no matter what you do to it. Google Chrome is still the most responsive browser in my opinion, even with multiple extensions it keeps performing very fast, start up/shut down times are very quick with only IE9 performing faster on my system. Chrome 10 lacks major new features, that is the nature of the release cycle, but one that is of note is the sandboxing of Adobe’s flash player, significantly improving security of the browser, along with this came the automatic updating of the plugin being handled by Google, meaning Flash is almost always up to date in Chrome. Chrome’s list of extensions are growing quite quickly and it was the first browser after Firefox that developers seriously developed extensions for, there are still limits on what the extensions can do but they are at a level that the average user will not notice now. Google Chrome is in my opinion the most locked down browser when it comes to options, this has been improved in the new options tab in the latest version, but they are still quite limited and it’s doubtful they will ever get to the level of Firefox or Opera. Overall Chrome is doing well at gaining users, the features and extensions continue to grow each month, it is considered to be a great alternative to Firefox. Internet Explorer version 9 was released on March 14, 2011. IE has the slowest release cycle out of all of the browsers, however version 9 is arguably the first widely anticipated version of IE. Developer previews of the engine have been available and regularly released to keep the community interested. 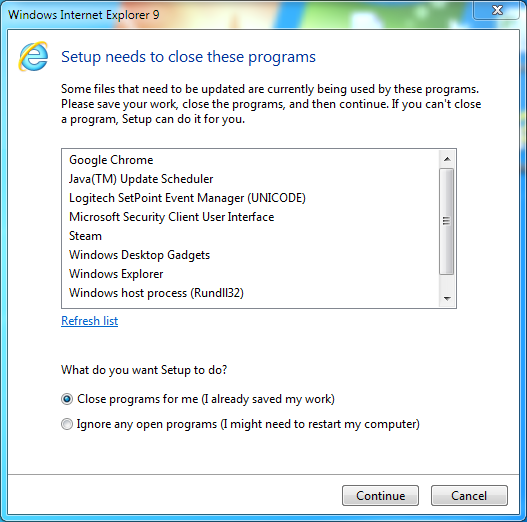 Internet Explorer has always been the slowest browser to install, however in Windows 7 it’s incredibly fast to install, only taking about 2-3 minutes at most, it did however request quite a few applications to close, including other browsers, it also closed and restarted explorer which means no restart was required, it did however trip my laptop’s security, warning that I had bypassed the windows login and I had to restart anyway for it to stop complaining. The IE9 UI is significantly simplified compared to earlier versions in IE9, it uses a similar concept to the Google Chrome OmniBar for the address bar, however that is shortened and the tabs are put on the same line, compacting the browser’s UI, this can however be changed back so that they are once again separated. IE9 x86 and x64 start very fast and the UI in general is very snappy, they seem to have removed or minimised as much animation in the UI as possible which helps the perception of responsiveness. Page rendering is similarly fast and it feels generally as responsive in real world terms as Google Chrome. A feature unique to the browser is Tracking Protection which uses lists to block web components that are used for tracking, this has to be configured and enabled to do anything but that takes no time, unless you’re using a different default browser, the link to get the lists on my PC takes me to the page in Google Chrome, from there the links don’t work, so the page url has to be copy/pasted into IE9, a minor inconvenience. IE9’s extensions are simply inadequate for many users spoiled for choice with Firefox and Chrome, however it does contain features built in such as the developer tools that other browsers normally need extensions to properly match. IE9’s UI is fairly customisable, not to the same extent as Firefox however, it contains the same preferences page of the previous versions which is full of features, only a few options have been added in the latest version, relating to the new features that have been included. Overall IE9 is a step up from previous versions, it has the speed, the UI and the features of the other browsers, but is still held back by it’s lack of good extension support. 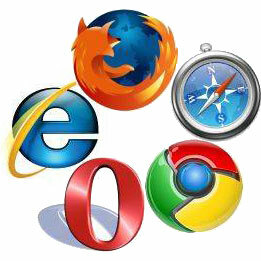 The latest version of Safari version 5 was released on March 9, 2011. Safari has a fairly traditional release cycle and added features per release are similar to Google Chrome. The Safari install is genertally one of the longest depending on whether you’re installing other Apple software or not, it is customisable but why Apple need to install a proprietary software update application for something as simple as a web browser seems a little over the top, as is the sheer amount of extra software and other “stuff” that gets installed with the browser. Note the last option only disables the schedule. Safari looks nice and simple, somewhere between Google Chrome and Opera, it does have seperate search and bookmark bars and the tabs open on the underside of the toolbars which I find ugly but other than that it is very much like Chrome. It lacks much of the customised UI that other Apple applications on Windows have. Upon it’s first open you’re greeted with a welcome screen that looks quite nice and the “Top Sites” page is nicely animated. The UI in general is simple and functional, a high point of this browser. The browser’s UI is quite fast but when it comes to actually loading websites, it seems a little slow, I was testing Google Chrome and Safari side by side on different sites after I first noticed this and Safari seemed to have trouble loading many websites fully, as if there was network trouble, even though Chrome was loading the same pages at the same time very quickly. Safari’s biggest new features seem to be better HTML5 support, Hardware Acceleration and Safari Reader. Safari Reader seems to work quite well and is able to pick up articles very well, however the ability to pick up pictures seems to need some work as thumbnails of larger pictures don’t seem to be included in the reader. Safari now has extension support and already there are many extensions available, I have been able to find many of the extensions I use on Chrome, the installation is easy, though a little slow in some cases and the extensions seem to have some freedom in what they do to the browser. Safari’s customisation is surprisingly good, better than Google Chrome but worse than Firefox and Opera, there are many options available and they’re easy to understand and set. Overall Safari’s new extension support brings it in line with other browsers, but it still seems to be too much of a unnecessary addition to the browser market, Google Chrome made it’s mark and changed browsers for the better, Safari never did that and continues to follow rather than lead, the unique features it has just aren’t enough and it continues to be bundled with software that it doesn’t need. The latest version of Opera version 11 was released on January 27, 2011. Opera also has a fairly traditional release cycle, however development versions are available often and encouraged to be tested by the community. There tends to be more changes in this browser than the others per version and they certainly aren’t afraid of mixing things up each release. Installation was blazingly fast, there were no options given and the whole thing finished in less than 15 seconds. However I did notice that Opera took it upon itself to become the default browser without my permission, not a cool move. First impressions show a clean and simple interface, common to Opera by now, it is slightly closer to the traditional ui than the Chrome ui found in browsers now, with the separated search bar and status bar included. However it joins the list of browsers that look hideous when enabling the menu bar. I also noticed one issue, double clicking the title bar accidently maximised the browser, however double clicking it again only opened a new tab which is a little inconsistent. Opera’s page loading speed looks great with low latency sites and the fast draw rate of components really feels like things are loading fast, however on higher latency sites (living in Australia most sites have >100ms latency) this effect is reversed and it makes it feel much slower than the average browser. This browser comes with some features unique to Opera, Opera Unite which allows you to stream many different types of information from your PC to the outside world, Opera Turbo which compresses and speeds up sites on slow connections and also Mail and Chat clients integrated which gives Opera the most features out of the box. Opera’s extensions list is quite large and I was able to find most of (or equivalents to) my favourite extensions, they installed quickly and easily, however one of them caused the status bar to send an odd message asking for something in about:config to be changed, on the plus side it was easy to find and the about:config page is quite user friendly, though most of the descriptions are missing. Opera has a great set of options and the UI is quite customisable, this is in many ways similar to Firefox, however it is much more polished and user friendly. Overall Opera 11 is a nice alternative to Firefox and brings a more traditional browser feel without losing modern features, it has more of a software suite feel than other browsers.